Francois Bayrou's campaign has unleashed a new weapon: retro gaming nostalgia. The European political scene is beside itself with speculation over the upcoming French presidential election. Two political heavywieghts - incumbent President Nicholas Sarkozy and Socialist leader Francois Hollande - are staring one another down in preparation for the final vote. Hollande has widespread support and a tenuous lead in the polls, but ideological fractures in France's left wing have forced him to spend precious time fighting for already left-leaning votes to throw at Sarkozy's well-founded, right-leaning campaign. Meanwhile, Francois Bayrou of the Mouvement DÃ©mocrate party is polling low and doesn't look set to progress very far into the race. He has, however, decided to hide an 8-bit campaign video in his website. Said video can only be accessed by hitting the old Konami keys (up up, down down, left right, left right, B, A, yo) into his site's homepage. Zut alors! I hear you cry. 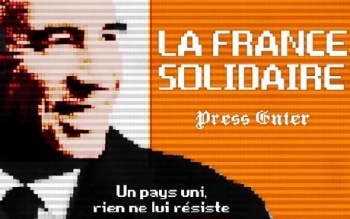 Typing in the Konami code unlocks a video of 8-bit M. Bayrou inviting voters to join him on a quest to take France back from Sarkozy and his ilk. "Nothing can resist a united nation!" spits his grainy voice. The rest of the video shows sprite-Bayrou marching across the land of Sarkollande (oh we see what you did there) on his mission to gather the six ancient artifacts which will allow him to purge the land of sad faces and false promises. The pieces in question, composed of (translations hastily provided by yours truly) "The Medallion of Redressing Public Finances" and "The Orb of Europe and the World," along with your vote, will allow M. Bayrou to succeed in his journey. M. Bayrou has yet to reveal why chasing the 8-bit vote from the knows-or-cares-about-that-Konami-code demographic has become a feature of his campaign. But does that matter? No. At least one of Bayrou's staffers appreciates older games and wants you to help her/his employer win the election by collecting six artifacts from six temples. Were I French, Monsieur Bayrou, you'd have come a few steps closer to having my vote.